Below is a surface water summary table showing methods of developing sources of surface water. 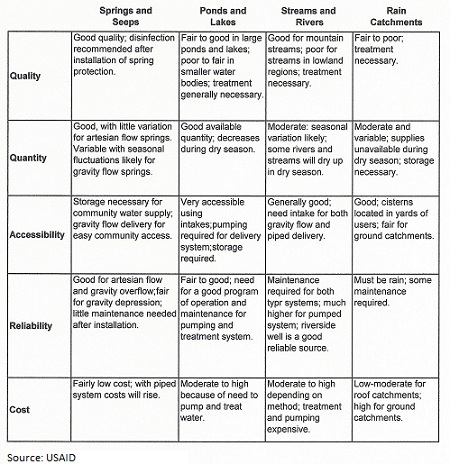 This table summarizes key characteristics of the methods of developing surface water discussed in this website. Water quality, quantity, accessibility, source reliability, and cost are summarized for each of the four methods discussed. Use this table for reference, but visit the individual web pages for each of the methods for important details concerning each one. Return to "Surface Water" from "Surface Water Summary"